The 2008 Mussels of the Month. The December 2008 Mussel of the Month is Pleurobema clava. Pleurobema is a genus of 35 species found in eastern North America from the Great Lakes to the Gulf of Mexico. Pleurobema is a common and widespread genus in eastern North America with almost three dozen species. This diversity is represented by both widespread species that advanced northward following the retreat of continental glaciers at the close of the Pleistocene, as well as species with more restricted ranges. For example, 26 Pleurobema are known only from streams draining directly to the Gulf of Mexico (i.e, not the Mississippi). Many of these are known only from single basins. Complicating our understanding of the genus is the fact that some species are known from very few specimens, and some are perhaps extinct. 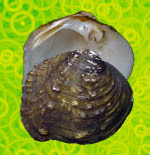 The November 2008 Mussel of the Month is Chambardia wahlbergi. Chambardia is a genus of 11 species known from the Delta to the Cape in Africa. Chambardia wahlbergi, if the going taxonomy is correct, is one of the most widespread freshwater mussel species in Africa, occurring from the Nile River in Egypt, through East Africa to the Zambezi, and south. Oh... and it is in West Africa as well. Various subspecies are currently recognized (e.g., Mandahl-Barth, 1988; Daget, 1998) across this expansive range. Unfortunately, the taxonomy is a mess, and where we have looked closely, we have found that C. wahlbergi is "lumped." For example, in the Angola Region, we pulled two species, Ch. welwitschi and Ch. moutai, out of Ch. wahlbergi (Graf & Cummings, 2006). And, we found Aspatharia marnoi buried in Ch. wahlbergi in the Nile (Graf & Cummings, 2007). We expect that as we keep looking, we will keep finding distinctive lineages lurking within this over-lumped species. This last September in Zambia, we managed to secure some specimens of Chambardia wahlbergi from fisheries ponds. The October 2008 Mussel of the Month is Arotonaias cyrenoides. Arotonaias is currently recognized as a genus of three species endemic to the area around Lake Nicaragua in Central America. So many of the freshwater mussel species known from Central America are not known well at all. For example, many genera have been so incompletely investigated that they cannot even be placed in the correct tribe (i.e., Nephronaias). However, other genera, like Arotonaias, can be reasonably assigned to the Lampsilini based upon such characters as sexually-dimorphic shells. Not only are there problems assigning Mesoamerican genera to family-level groups, but the species diversity isn't well described either. The taxonomy of this geographic assemblage has not really been thoroughly reevaluated since Frierson (1927) — subsequent species lists by Haas (1969) and Graf & Cummings (2007) merely repeat Frierson's system. Given that the currently recognized diversity of Central America freshwater mussel species is greater than 50% of the total for the whole of the Neotropics (102/172), it is our impression that there this is an over-estimate. 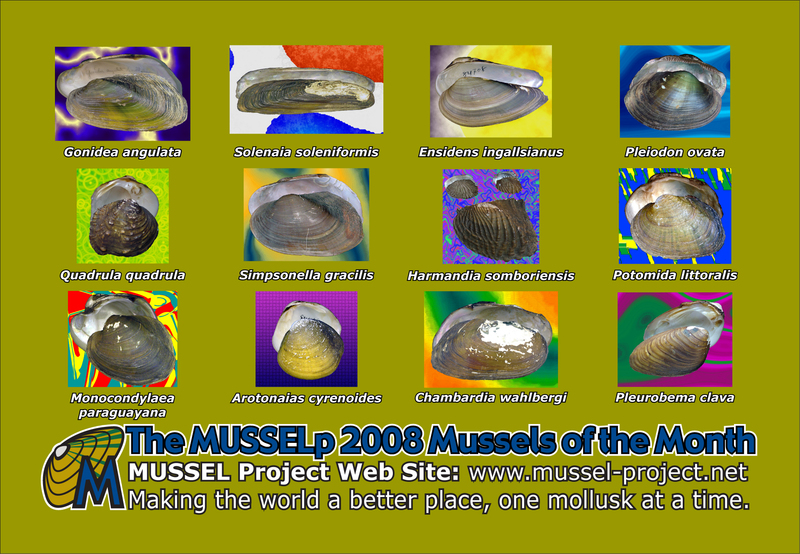 The September 2008 Mussel of the Month is Monocondylaea paraguayana. Monocondylaea is currently recognized as a genus of three species occurring only in South America. The taxonomy of Monocondylaea (and other Neotropical genera of freshwater mussels) is currently in a state of flux. Haas (1969), for example, recognized 5 species, whereas only three were listed as valid by Simone (2006). In general, between the global treatment of Haas and the almost continent-wide revision by Simone, the acknowledged diversity of South American mussels has decreased, although only slightly. By our estimate, Haas (1969) listed around 187 species as occurring in South America, whereas our finally count after incorporating Simone's results was 172. This is in contrast of the Old World, where Haas consistently under-estimated freshwater mussel species diversity (Graf & Cummings, 2007). 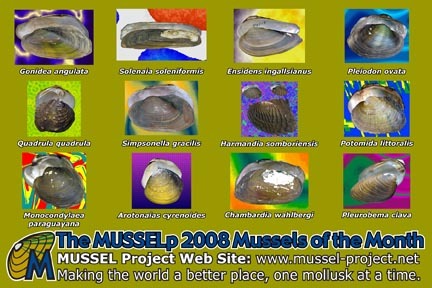 The August 2008 Mussel of the Month is Potomida littoralis. Potomida is considered a monotypic genus with a circum-Mediterranean distribution. P. littoralis is a widespread species in southern Europe, northern Africa and the Middle East. Like other widely distributed freshwater mussel species in the rivers of the western Palearctic, this one is also highly variable and several subspecies are recognized. However, the philosophies and methods by which these taxa have been recognized are now dated, and a modern approach to understanding the evolution of Potomida littoralis populations (as well as for other European species) may result in a revision of the genus. The phylogenetic placement of Potomida is also of interest. Unlike the other unionid genera of Europe (like Unio and Anodonta), P. littoralis lacks the hooked-type glochidia of the subfamily Unioninae. Graf & Cummings (2007) left this species as "incertae sedis" within the family to emphasize the cloud that hangs over the higher taxonomy of this lineage. The July 2008 Mussel of the Month is Harmandia somboriensis. Harmandia is a genus of two species endemic to Indochina, although some authors have claimed the type species is merely a hyriid from South America. The genus Harmandia illustrates well the superficial similarity between some Indotropical unionids and Neotropical hyriids. The classical, conchological distinction among these lineages has been beak sculpture: hyriids (like Castalia) have radial beak sculpture. Or, it can be radial like in the South American Prisodon (Triplodon). But, there are southeast Asian genera with similar sculpture, such as Scabies and Harmandia. Based upon soft-anatomy, these genera can be place in the correct family, and these shell characters can be seen for what they are: misleading. This bears upon the diagnosis of fossil Hyriidae, especially those forms from the Triassic of North America, which other seem quite far out of range. In the specific case of Harmandia, the type species, H. somboriensis, has only been known by two, small specimens from the Mekong River. Many authorities, like Haas (1969) and Simone (2006), have simply regarded Harmandia to actually be a Triplodon erroneously assigned to the Indotropics. Brandt (1974), however, claimed to have collected larger specimens of H. somboriensis in the Mekong. He also described a second species in the genus, H. munensis. The June 2008 Mussel of the Month is Simpsonella gracilis. Simpsonella is a genus of two species endemic to the Philippines. Anodontine mussels — the kind with reduced hinge teeth and large, subtriangular hooked-type glochidia — are not particularly common to Indochina or South East Asia, generally. We count only four species south of China on the Asian mainland and none on Sunda Islands of Indonesia (Java, Sumatra or Borneo). Of course, the Sunda Islands have a reasonably diverse freshwater mussel fauna of around 28 species. It is just that none of them are anodontines (Graf & Cummings, 2007). But there are only two species of freshwater mussels on the Philippines, and both of them are anodontines of the genus Simpsonella. We really don't have much else to say about it, other than it is a biogeographical anominally that would be worth following up with some systematic research. The May 2008 Mussel of the Month is Quadrula quadrula. Quadrula is a fantastically sculptured genus of four species from eastern North America. We have recently proposed some taxonomic changes to old genus Quadrula based upon some recent molecular work. It is appropriate for us, then, to use the opportunity of Q. quadrula's status as Mussel of the Month to discuss those revisions. The tradiational taxon of Quadrula (as listed in Burch, 1975 and Turgeon et al., 1998) contained 19 species, in addition to the species Tritogonia verrucosa. Contrary to this long-held system for these species, the molecular phylogenetic study by Serb et al. (2003) recovered Quadrula as paraphyletic, with Tritogonia nested with the larger Quadrula clade. One conclusion that could have been derived from this result would be to sink T. verrucosa into Quadrula, and that would have been perfectly reasonable. However, Serb et al. also found that the relationships among the species of Quadrula conformed quite nicely to the traditionally-recognized species groups and some already-named subgenera. Rather than bury all the information gained by that splendid analysis, we (Graf & Cummings, 2007) simply elevated the subgenera to genera. This action not only retains Tritogonia but splits the old Quadrula into three genera: Quadrula, Theliderma and Amphinaias. The April 2008 Mussel of the Month is Pleiodon ovata. Pleiodon is an Afrotropical genus of two or three Recent species found in West Africa and Lake Tanganyika. The unique hinge morphology of Pleiodon makes it an interesting genus. Members of the genus Pleiodon (as well as a couple species of Mutela) have what is referred to as "pseudotaxodont" hinge dentition, for its convergent similarity to the taxodont teeth seen in marine protobranch bivalves. The purpose of hinge teeth in a bivalve is to help the valves articulate and to reduce twisting at the ligament. Typical freshwater mussels have schizodont hinge teeth composed of anterior pseudocardinal teeth and posterior laterals. Both the anterior and posterior teeth, although differing in length, can be described as interlocking ridges running in the anterior-posterior direction. Among some species, especially thick-shelled North American amblemines, the anterior pseudocardinals may be more peg-like than lamellar. Among the species of the Iridinidae generally, however, the hinge is usually edentulous, lacking hinge teeth. In the pseudotaxodont teeth of Pleiodon species, the parallel ridges run in the dorsal-ventral direction on the hinge and are more numerous. The value of this conspicuous, diagnostic characteristic is that it can be easily recognized in the fossil record — as opposed to the diagnostic characters of other genera that are in the soft-parts and typically not preserved. The freshwater mussel family Iridinidae is currently restricted to the Afrotropics, but, because species referrable to Pleiodon are so distinctive as fossils, it is hypothesized that the paleo-distribution of the family might be much wider. Parodiz and Morris & Williamson have reported Pleiodon from Cretaceous strata in both South and North America. This fits well with the fossil record of other etherioidean families and further research would be valuable for understanding the evolution of the Unionoida. The March 2008 Mussel of the Month is Ensidens ingallsianus. Ensidens is a genus of only two species in the Indotropics. We know very little about Ensidens ingallsianus except that it belongs to the family Unionidae; its affinities within that family have not been evaluated phylogenetically. The genus is generally distributed in SE Asia (Cambodia, Thailand, Vietnam, Laos, and Malayan Peninsula). E. ingallsianus has unhooked glochidia and broods its larvae in all four demibranchs ("gills"). The February 2008 Mussel of the Month is Solenaia soleniformis. Solenaia is a genus of five species from throughout the Indotropics. Solenaia is found throughout southeastern Asia, from India-Burma and Indochina, north to the Yangtze. A new species, S. khwaenoiensis was recently described from Thailand, and perhaps the diversity of this genus will grow as new areas are explored. Solenaia soleniformis, as the name suggests, resembles the marine bivalve Solen. This elongate, edentulate morphology has arisen multiple times within the Unionoida, and this convergent shell morphology has historically caused some confusion in the taxonomic literature. However, while the shells of these lineages may have a similar appearance, when the soft-parts are available, there can be no confusing members of different these different families. In fact, for the most part, the family to which these genera belong can be determined from the shell alone, once one is familiar with the conchological synapomorphies of the different groups. It does become difficult to infer anything about relationships among the southeast Asian unionids with elongate shells lacking robust hinge teeth. We expect that as molecular characters are added to the growing morphological database, some of these mysteries will be unraveled. The adaptive advantages of various shell shapes have been discussed by Savazzi & Peiyi and Watters. The January 2008 Mussel of the Month is Gonidea angulata. Gonidea is a monotypic genus restricted to Pacific drainages in western North America. Gonidea angulata is an interesting mussel. It was originally described as an Anodonta. Based upon the shell, that really isn't too unreasonable since the hinge is complete edentulous. But the soft-parts of this mussel are completely unlike any anodontine: it broods in all four demibranchs and the larvae are the smaller semi-circular type that lack hooks. Except for lacking hinge teeth and having such a thin shell, Gonidea shares more traits with Amblema than Anodonta. However, Gonidea takes this puzzle even further: the septa that divide the demibranchs into water-tubes are perforated rather than continuous, and that is more like a mussel from southeast Asia or Africa than other species from North America! Arnold Ortmann, the Grand-Daddy of Modern Mussel Research, provided a detailed description of the anatomy of Gonidea angulata in 1916. The weirdness of that species broke the classification that Ortmann has been using to arrange the genera of the Unionidae. As he acquired more and more specimens of taxa, Ortmann continually modified his arrangement to account for new data. Eventually, this transformed his fairly simple system devised for the North American fauna into one that was complicated but able to accommodate the Old World specimens his colleagues were sending him. It was Gonidea angulata that finally broke the classification. Ortmann decided that he couldn't adequately delimit the subfamilies of the Unionidae, and in future anatomical descriptions didn't even try. With the introduction of molecular data and cladistic methods, we have been able to get a more accurate handle upon the phylogenetic position of Gonidea. We will know more about Gonidea and the evolution of the Nearctic Unionidae when we have sampled more taxa from the Indotropics. 2008 MUSSELp Mussels of the Month Postcard.